Sandbox News - Enjin - Are you ready for what comes NEXT in no mans sky? 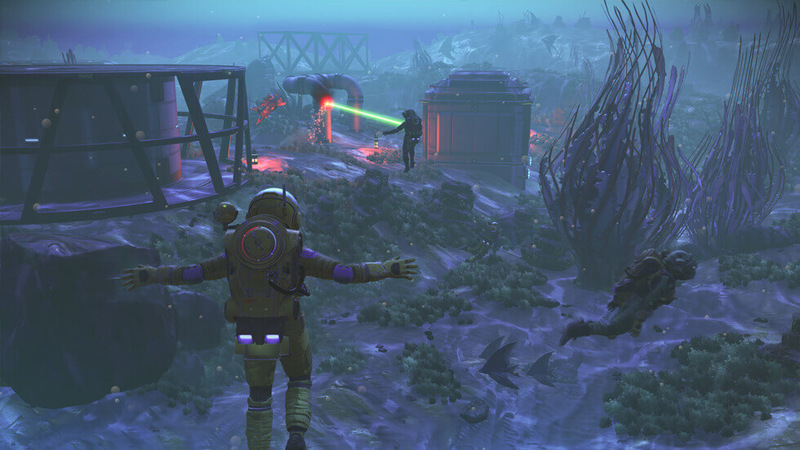 Are you ready for what comes NEXT in no mans sky? it received so much fan fare & hype (me included).Fans Quickly began there own speculation based on ideas and pictures that sean murray was sharing with the world. regarding multiplayer in particular. Indeed the HYPE around NO MANS SKY was massive! However, that HYPE was.... over exagerted. Don't get me wrong, No mans Sky was/is a great game when it was released. However, it was severely lacking a lot of the gameplay features that sean murray had been mentioning it would have. Apperently what was no expressed enough was that the inital game we would be getting was really, a pre-release.. or beta version of the game. Had he said that, maybe everyone would not have over reacted with the lack of true multiplayer and so forth. Heck, I even sold my XBOX ONE with all the games i had collected just so i could finally get an PS4 so i could play No mans Sky. Of course, by the time i came into Sean Murrays Universe, No mans Sky had already received several updates. Including the Atlas Rises update which added several great new features to the game. called the "NEXT" update. and with it.. there is a massive new HYPE train that has been brewing with it. The "NEXT" hype train actually started with a augmented reality game called "waking titan" which involved fake websites, real world shops setup by hello games, and real people/employees. Theres a lot to go read about involving No Mans Sky, so.., you may want to google it. 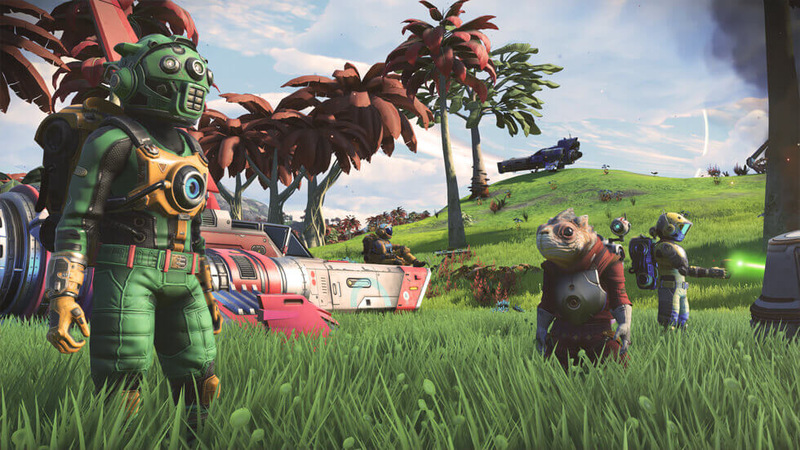 So what does this new Update to No mans Sky bring, and why should you join the HYPE train? well for starters, the NEXT update brings the game to the XBOX ONE. (WHY DID I SELL MY XBOX?????!!!!) along with TRUE multiplayer. Cross play Multiplayer. thats right, PS4 and XBOX ONE players will be able to connect to the same universe together.The recent NEXT UPDATE video that dropped revealed several other features which have also been confirmed by early testers and players/reviewers of the NEXT update. For instance, base restrictions have been removed. You can now build ANYWHERE and everywhere you want on ANY planet you explore or claim! There are systems in place to prevent greifing so you won't have to worry about that. reportedly, Over 2,000 new building peices have been added in as well. so, the odds of finding 2 buildings exactly the same will be SLIM to none. On top of that, you can own as many bases as you want. Similar to Minecraft in this regard, you can build a base that starts underwater and then spreads onto land and INTO mountains. New planet types have been added inas well , such as RINGED Planets.If you watched the trailer for the NEXT update, then you'll know that.. the ringed planets look pretty spectacular! The Draw distance as been greatly improved along with depth and sense of scale issues. TRUE player models have been added in. Allowing you to play in 3rd person or 1st person. Its also been confirmed that you can play as ANY race in the game. Gek, Vy'keen or the Korvax. Other confirmed additions are things like craftable portals which will allow you to place portals near or AT your bases for easy travel between worlds. This will also allow you to connect easier with your freinds when they happen to be a million light years away from you. Another exciting thing that has been added in is a large update/expansion to freighers. You can now own more than 1 freighter, and command them from your frigate. You can hire NPC's to manage your freighters. You can accept missions and send your frieghter to other star systems to accomplish those missions. This is something that will happen in real time. So, you could follow the frieghter to the other star system and assist or watch as they accomplish the mission. Frigates and freighters can also be like a HUB platform allowing you and your freinds to travel to various star systems together to .. explore,raid, pirate, steal, pluner, trade, buy/sell, or.. lay claim to the worlds. 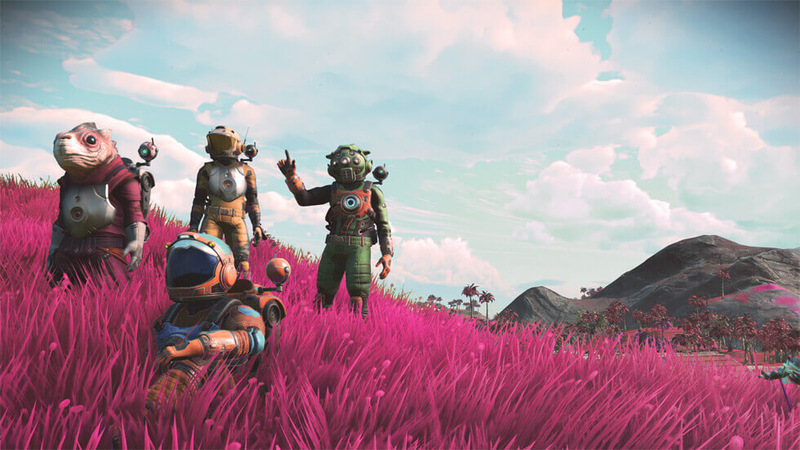 The NEXT update for No mans Sky as pretty much overhauled everything we knew about the game.Indeed, what we've been playing in for the past 2 years as really been more like beta testing for the real game that was to come. No Mans Sky NEXT IS the game that many of us were HYPED about being released over 2 years ago. There is so much more to discover and find as we journey into the universe. My fellow readers, Its time to get HYPED again for No mans Sky!